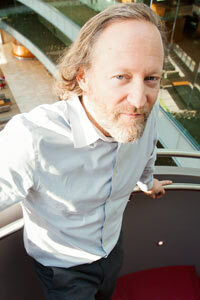 Krakauer’s research focuses on the evolutionary history of information processing mechanisms in biology and culture. This includes genetic, neural, linguistic and cultural mechanisms. The research spans multiple levels of organization, seeking analogous patterns and principles in genetics, cell biology, microbiology and in organismal behavior and society. At the cellular level, Krakauer has been interested in molecular processes, which rely on volatile, error-prone, asynchronous, mechanisms, which can be used as a basis for decision making and patterning. He also investigates how signaling interactions at higher levels, including microbial and organismal, are used to coordinate complex life cycles and social systems, and under what conditions we observe the emergence of proto-grammars. Much of this work is motivated by the search for ‘noisy-design’ principles in biology and culture emerging through evolutionary dynamics that span hierarchical structures.